Some of our favorite things to do for Lent! 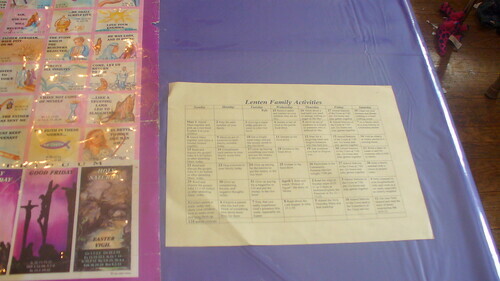 I have had this calendar for many years. My mom gave it to me. It has the bible readings for each dan and is a good way to keep track of where we are in Lent. 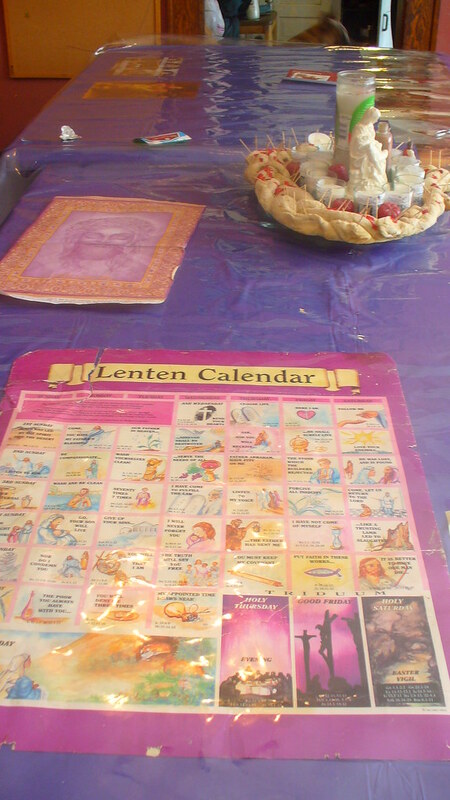 A calendar of activities for each day in Lent! 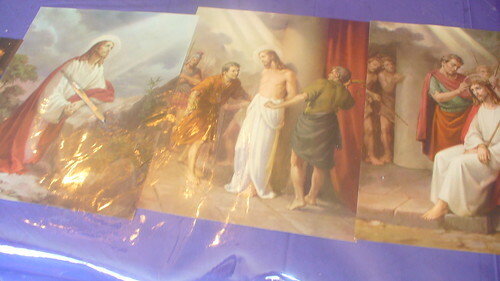 The sorrowful mysteries that I bought a few years ago from Catholic Heritage Curricula. 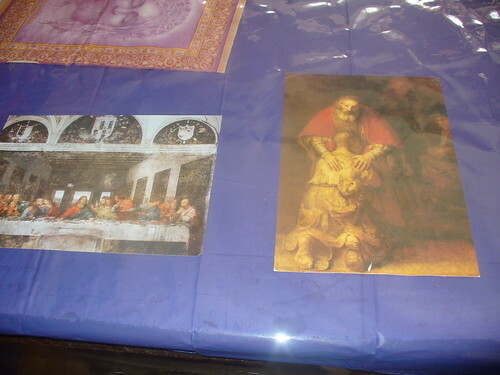 As this is the year of St. Paul, he is on the table every day, even in the midst of our Lenten centerpiece. 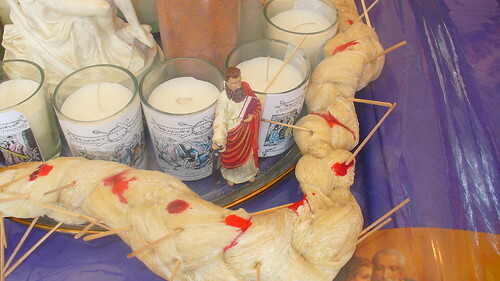 We've made the Lenten wreath for a couple of years now. This year I let Izzy and her friends make it by themselves - which explains why it isn't exactly round! But still they did a good job. Gabe has been taking out his toothpicks dutifully although I told him I did not think he should get one simply for getting up in the morning!. 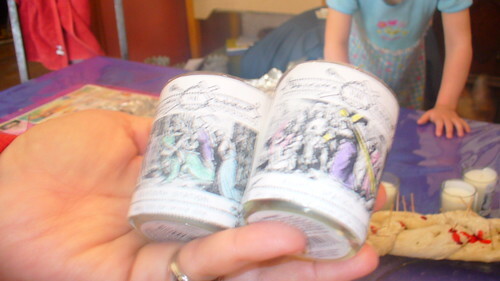 The bottles of sand was an idea inspired by the book"Arts and Crafts for Lent" by Jeanne Heiberg. 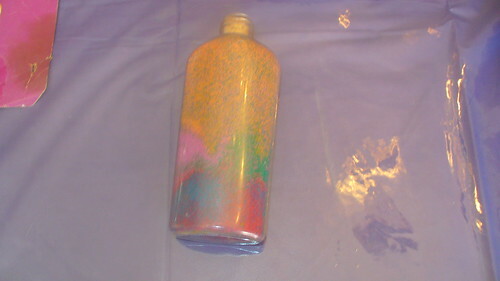 I bought some inexpensive plastic bottles at the craft store and some colored sand. The Sand of course represents the dryness and the thirsting for Christ that we experience during Lent, also the wandering in the desert by the Israelites before reaching the promised land. Each color of sand has significance. The beige or brwn sand represents the desert. Yellow for the transfiguration and light of revelation, blue for baptism and healing waters of life, green for healing and forgiveness, purple for Chris'ts kingship, red for Christ's passion and white for the lamb of God. Each bottle turned out a little bit differently as the children filled them. 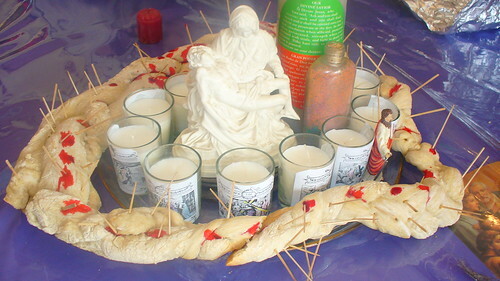 I got the idea for the stations of the cross votive candles from the Just Another Day in Paradise Blog. The candles were 57 cents each and I found the stations on the internet and had Izzy color and past them on the candles.